Need more information about booking Home 7646630 ? 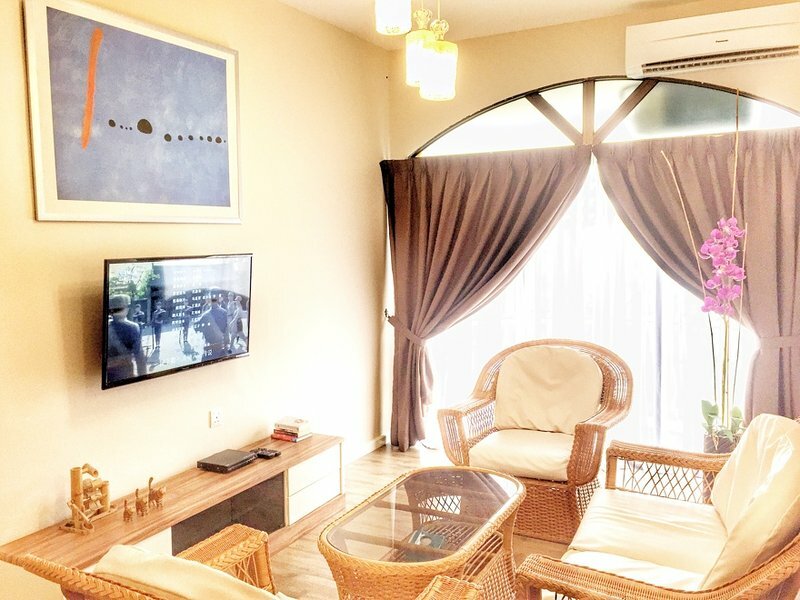 Offering quality accommodations in the sightseeing, restaurants, shopping district of Langkawi, Condo Asia Langkawi is a popular pick for both business and leisure travelers. From here, guests can enjoy easy access to all that the lively city has to offer. With its convenient location, the condo offers easy access to the city's must-see destinations. Offering our guests superior services and a broad range of amenities, Condo Asia Langkawi is committed to ensuring that your stay is as comfortable as possible. Top features of the condo include free Wi-Fi in all room and living area , car park. Kitchen equipped with kettle, microwave, fridge & etc. Step into the inviting condo and escape the stresses of the day with a wide range of amenities such as air conditioning in all room and living area, desk, balcony/terrace, fan, internet access – LAN (complimentary) which can be found in living area. The condo offers fantastic facilities, including outdoor pool, pool (kids), garden, to help you unwind after an action-packed day in the city. Condo Asia Langkawi is a smart choice for travelers to Langkawi, offering a relaxed and hassle-free stay every time. You can get in touch with Kian Chew (the owner) through the contact form on this page. Send Kian Chew (the owner) an email through the contact form on this page. Alternatively, if there’s a phone number on this page, you can call them. How do I contact Kian Chew (the owner)? If you’ve already booked, go to Manage your holiday booking to view Kian Chew the owner's contact details or send them a message. Or send Kian Chew (the owner) an enquiry through the Contact the owner/manager form if you’d like a quote or more info first. When you pay online through the Book your stay form, a booking request is sent to Kian Chew (the owner). You’ll find out within 24 hours whether they’ve accepted - no money will leave your account before then. You can also request a quote from Kian Chew (the owner) through the contact form. The owner will email you the total cost for your dates and a link to book and pay online. Use the Book your stay form to pay provisionally online. You can pay by credit/debit card or PayPal. Kian Chew (the owner) will have 24 hours to accept the booking and no money will leave your account before then. Why can't I call Kian Chew (the owner) before booking? You’ll need to contact Kian Chew (the owner) to do this. Send them a message in Manage your holiday booking or through the contact form on this page. You can request to change the dates or number of people on your booking via the Manage your holiday booking page. To change your holiday dates use the Edit booking button. If you need to change the number of guests staying then send Kian Chew (the owner) a message. If Kian Chew (the owner) agrees, they’ll send you a revised quote outlining the changes. You can review and accept/decline this from the Manage your holiday booking page. You’ll have 48 hours to take action before the revised quote expires.